Time for another look at the jewel collection of Crown Princess Margareta of Sweden, who was born Margaret of Connaught. Today's focus is on another of her less glittering pieces: her delicate gold cuff bracelet. What seems like an insignificant piece is actually one of the more important sentimental pieces of jewelry for Margaret's Danish descendants. Margaret and her sister, Patricia, wore identical gold cuff bracelets on their left arms; you can see Patricia's bracelet on her left wrist in this W&D Downey picture postcard. To my knowledge, it's never been made clear where Margaret and Patricia got their gold bracelets, but I would wager that the tokens were gifts from their parents, the Duke and Duchess of Connaught. 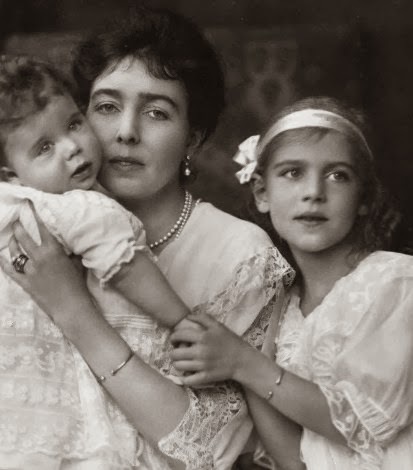 In 1915, Margaret carried the tradition to the next generation when she gave her daughter, Princess Ingrid of Sweden, an identical gold bracelet as a fifth birthday present. You can see Margaret and Ingrid both wearing their gold bracelets on their left arms in the photograph above, which was taken not long before Margaret's death in 1920. 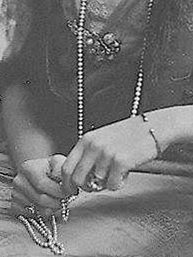 The photograph on the right, which shows Margaret wearing the bracelet on her left wrist, also shows her twisting the same strand of pearls that we discussed last week. Margaret's bracelet was apparently big enough to slide up and down her arm, as it is shown both at her wrist and situated further up on her forearm. Princess Ingrid was only ten when her mother died, so it should come as no surprise that she decided to carry on sentimental traditions, especially regarding jewelry, that had been begun by her late mother. 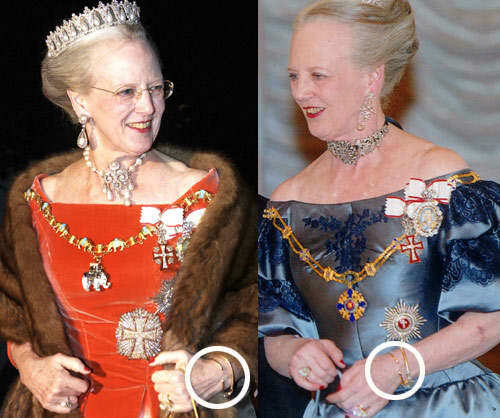 That includes the gifting of identical gold bracelets to each of her daughters -- Margrethe, Benedikte, and Anne-Marie of Denmark -- on their fifth birthdays. A Billed-Bladet report notes that the child-sized bracelets are exchanged for a larger size later . 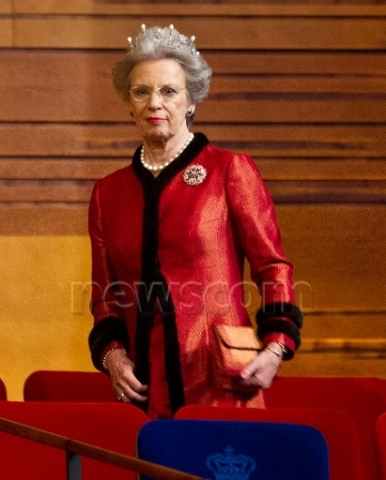 Margrethe, who is now Queen Margrethe II of Denmark, regularly wears her gold bracelet, even amid all of the splendid, sparkling jewels she sports for official functions. Like the women of previous generations, they wear the bracelet on their left wrists. You can spot it on Margrethe here, at a banquet during a South Korean state visit. It's also visible in more than one of the queen's official portraits , and you can see it here among her jewels for the annual New Year's Court . In this photo of the young Danish princesses, you can see Anne-Marie, the future queen of Greece, wearing her bracelet. Just like their big sister, Benedikte and Anne-Marie continue to wear their gold bracelets, although at one point, Anne-Marie's broke and had to be repaired. 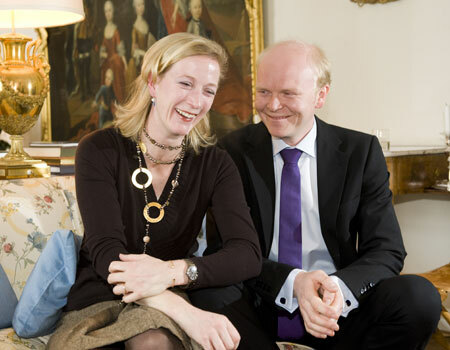 Anne-Marie has stated that she was "deeply unhappy" when the bracelet broke, underscoring the sentimental importance of these simple pieces to the women of the family . All three of the sisters regularly stack their gold cuff bracelet with other pieces (as Benedikte does here), so sometimes you have to look carefully to find it. Benedikte and Anne-Marie have passed on the tradition to their own daughters, Alexandra (here's hers), Nathalie (and hers), Alexia (and hers), and Theodora (and hers!). Only direct female descendants participate in the tradition, so while you see Crown Princess Mary wearing pieces of Ingrid's jewelry, you won't see her (or Princess Marie, or any of the wives of the Greek princes) wearing one of these bracelets. While Margrethe didn't have any daughters, she was recently able to carry on the tradition by giving one of the bracelets to her granddaughter, Princess Isabella, on her fifth birthday in 2012. The young Danish princess has been photographed several times wearing her new gold bracelet -- here's a closeup of her bracelet taken during the christening of her cousin, Princess Athena. These childhood bracelets aren't discarded when they're traded for a larger size later on, and Billed-Bladet has speculated that the bracelet that little Isabella wears now is the very same one that Queen Margrethe received from Queen Ingrid in 1945. Although for many years there were no young princesses in the Danish royal family, there are now two more little girls waiting to receive their bracelets. 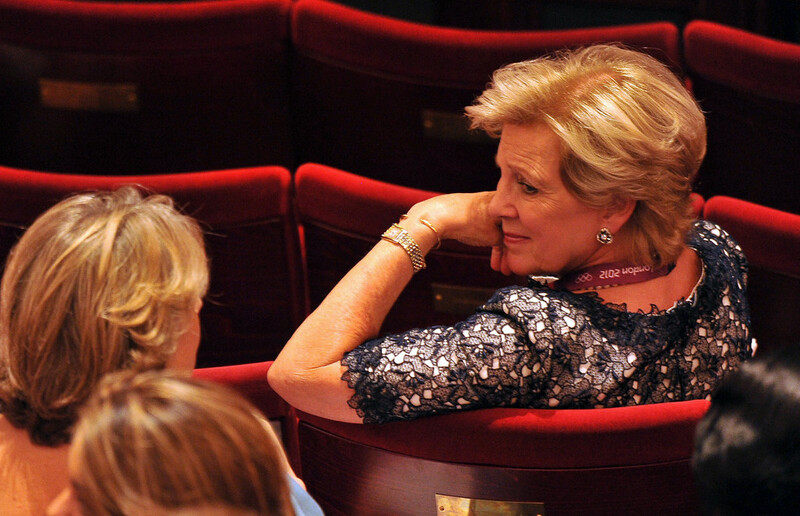 Isabella's younger sister, Princess Josephine, will receive her bracelet exactly two years from today. (Happy third birthday, Josephine!) And their cousin, Princess Athena, will receive her bracelet a year later, in January 2017. Here's hoping that this sweet tradition, begun with the Connaught princesses and continued for five generations, will be kept up for years to come! 1. Photograph in the public domain due to its age. 2. Detail of picture postcard of Crown Princess Margareta of Sweden; original source here. 3. 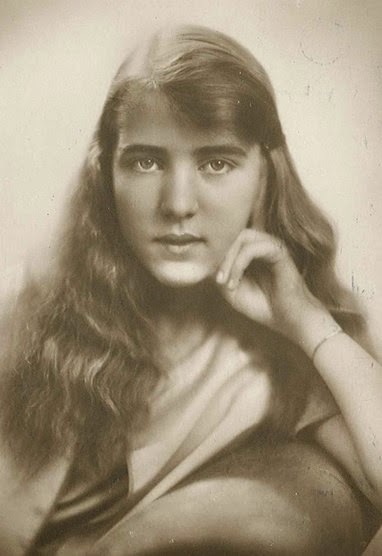 Cropped version of picture postcard of Princess Ingrid of Sweden, available at Wikimedia Commons; source here. 4. Read the Billed-Bladet article (in Danish) here. 5. See the queen's left arm in this portrait and this one. 6. The photo comes from a Hello! article about the bracelets; read here.